On the Highway 34 bike path on Sunday afternoon. On Sunday I took a ride down the Highway 34 bike path to check things out. A short section of the path, less than half a mile west of Colorado Lake Drive, still had water running across it. 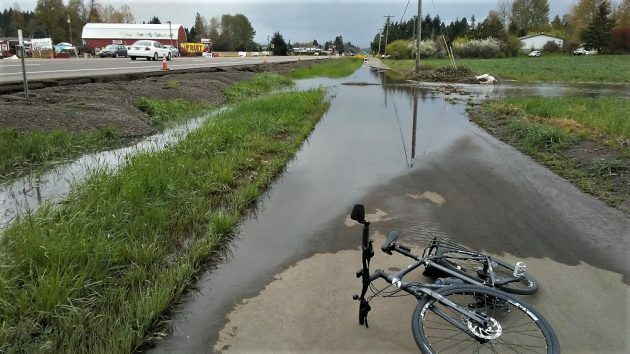 It was passable, I’m pretty sure, but I didn’t test it because I didn’t want to get my feet wet. 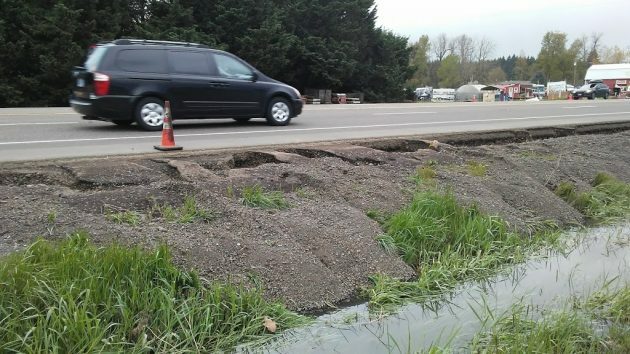 The same area of the highway, between Colorado Lake Drive and Peoria Road, is where ODOT says crews will be working starting Monday, getting rid of debris, clearing culverts, and rebuilding the highway shoulders. Then, the week of April 22, crews are expected to work on the highway between Peoria Road and the bypass. Notice how last week’s flooding undercut the pavement on the highway’s westbound shoulder.